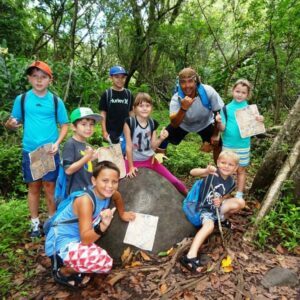 Maui Treasure Hunt Adventure & Ocean Center Combo Package – If you are nature lovers and adventure seekers, Maui is the perfect place for you, the ideal destination for families wanting to play in the outdoors. That is why we’ve created this awesome combination of the Hawaiian land and sea life adventure. That is why we created the Maui Treasure Hunt Adventure & Ocean Center Combo Package. With us, you will learn and have fun at the same time. Maui Treasure Hunt Adventure Ocean Center Combo is very unique and one of a kind. You and your children will have a fantastic time outdoors together! Our tour takes a place in beautiful nature, with the most amazing scenery. This is a real outdoor adventure, so prepare to get sweaty! You will be hiking in lush green nature, fulfill fun tasks while searching for a treasure. Your children will have a time of their lives. They will reveal the mystery of a lost treasure and will be the ones to find it. A great time for the whole family, guaranteed. We go rain or shine. We never cancel. If hazardous conditions occur due to bad weather, we alternate our route to the west side of the island, so your adventure is guaranteed! 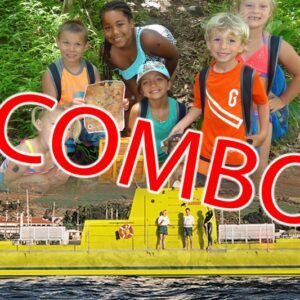 After this exciting Treasure Hunt, you will be able to visit the Maui Ocean Center on your own. At your arrival, enjoy lunch at the Seascape Ma’alea restaurant (see kids menu below – not included in the price). Once you recharge your energy, explore our 750,000-gallon salt-water aquarium, 54-foot acrylic tunnel, and nearly 2,000 fish, rays and sharks – the largest one in the state along with 60 indoor and outdoor exhibits. Aptly named “The Hawaiian Aquarium,” the Maui Ocean Center is the only aquarium in the world dedicated to fostering understanding, wonder, and respect for Hawaii’s marine life. You can do both activities on the same day or if you wish to on different days. You can visit the Maui Ocean center any day and time you want. Restriction & Requirement: Our treasure hunt hiking adventure is meant for children 5 years and older. But we welcome children of all ages. Children under 7 years old must be accompanied by an adult and adult must assist the child during the hike. Our guide is not going to watch your little one. He is a way to busy keeping our older Keiki safe and busy while looking for a treasure. This activity is intended for participants who are physically fit. All participants must be able to squat down and up without any assistance by another person. We are going rain or shine, no cancellation possible due to a weather condition. All participants must be able to walk without assistance which requires physical abilities similar to climbing and descending without the support of a handrail or other walking aid. If you have a problem walk on the stairs, this activity is not suitable for you. If you had surgery shortly before the journey, you may set yourself into high risk and you may also hinder the rest of the group. Cancellation: Associated with cancellation fee (terms and conditions), rescheduling 48 hr for all reservations, and 72 hours for groups of 6 or more. If hazardous conditions occur due to bad weather, we reserve the right to switch the location (we’ll let you know about those changes via email – check your email day before your Treasure Hunt adventure) without any entitlement for a refund. There will be no refunds or cancellations available. Running shoes or sports sandals. Your shoes may get muddy, dirty, and/or wet on any of our hikes. Shorts and short-sleeved shirts or t-shirts are the best. If mosquitoes really bother you (your guide carries repellent), you could wear long pants and a long-sleeved shirt. Also, you’ll want to wear your swimsuit so you can swim in the waterfall pools (optional). Towel: Swimming is optional, Sunscreen: Helpful on any tour, Camera & Phone: Please bring a Ziploc or a plastic bag to prevent any damage from moisture. You are responsible for any personal equipment you choose to bring along. Therefore we can take photos during the tour you can purchase on CD or USB, or video on GoPro you can also purchase on DVD or Blu-Ray and you can order online or via phone. You can also rent a GoPro camera from us. Transportation, Water, Snacks, Backpacks, Ponchos, in case of rain, Insect repellent, if needed, and of course, our guide to keeping you safe. On some hikes, there are toilets or porta potties at the trailhead. Once we’re hiking, though, we head for the bushes. If you’re uncomfortable using the bushes, please let your guide know before the hike begins so you can both decide what’s best for you. Turn left across the highway into Park n’ Ride commuter lot against that wall. Fantastic Treasure Hunt Adventure with the family. 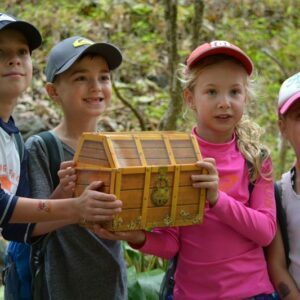 I booked a treasure hunt adventure for my family of 4 (2 boys, ages 8 and 5). The website took a little time to maneuver but was able to book my excursion. They followed up with a phone call to confirm the appointment, which was great. As tourist, we had no sense of time trying to get from Kapalua to Kahului and was almost late for the pickup at the park and ride. They were really cool about it when we called them telling them we are on our way and they said they would wait for us when they could have said sorry no refunds and ditched us. Our tour guide, Mark was really great with my kids during the ride up and on the treasure hunt. He was patient and kind and was very supportive and positive with my kids as they tried to overcome their fear of walking thru the jungle and the slippery rocks. In my opinion, age 8 is probably the maximum age you want to have your kids doing this Treasure Hunt ( I believe they offer other types of treasure hunts so check on the reviews on those). It is pricey for a family of 4, but we made so many memories on this excursion I would recommend it to anyone family with small children. What youngster doesn’t want to search for hidden treasure?! My 6 year old grandson loved this excursion and was fully engaged with the guide who took them on this 3-3.5 hr hike, following the clues, doing activities, and swimming in a lagoon. My daughter was equally engaged because of the beautiful terrain and what she learned about Maui culture and local plants – she came back refreshed and rejuvenated from her outing. The kids are provided snacks and come home with a treasure map and trinkets from the treasure box. Do this with your kids! An easy treasure hunt, the kids love it, the parents will love the views, and everyone will love the lagoon you can stop in for a swim. A half day worth all of the fun and memories. Mark is a knowledgeable guide who made it fun for all ages. It was our first vacation on Maui. As a family we love doing things together. It’s not always possible since our kids are not old enough to participate in many activities. When I saw the Treasure Hunt Hiking tour on Stardust Hawaii’s website, I got super excited and booked it. Our son is 7 and he is totally into pirates, treasures and secret maps! Our daughter is 5 and she can do whatever her brother does. We had a fantastic time together. The whole experience was great, we spent a beautiful day outdoors with our guide Phil. He had excellent knowledge of the area, and made it super exciting for our kids. The hike took place in a beautiful forest with waterfalls where we all got to swim. The kids followed a secret map, which led them to a treasure. On the hike we were asked to fulfill tasks and answer riddles. It kept our children entertained and in eager anticipation of what will come next. We had a fantastic time together as a family! I strongly recommend this tour to all families with children! Savanna Treasure Hunt Adventure – the Best for your kids!